Over the last few weeks I have been thinking a lot about death. On my travels to Ireland, I realized just how differently death is dealt with there, rather than America. Perhaps because it is a much older country and Ireland has always had such a spiritual side – be it pagan or religious – death in that place is vastly different than here. There are graveyards everywhere. Even when the church that used to stand is in ruins and the elaborate grave markers are no longer legible, there are flowers and visitors to the cemetery, or little notes and quiet conversations with the dead. It is not as if the culture is a death worshiping one, because it is not – it is simply that the memories are longer and the respect for both ancestry and friendship runs deep in the veins of those who live. As we traveled, taking pictures of gorgeous ruins, elaborate graves and old churches, we ran into enough people sitting quietly in the middle of nowhere and speaking in low Gaelic to the friend or relative in the ground that we started getting uncomfortable with our intrusions. This was on us though and the way that our culture views death – I don’t think that we offended anyone by our presence in the medieval graveyards. While I am sure that some of those conversations were about the crazy girls with the cameras and how odd it was to see them in December, we never got a scandalous glance – just a few shakes of the head or confused looks and some who clearly wondered if we too were visiting a long-lost friend or family member. 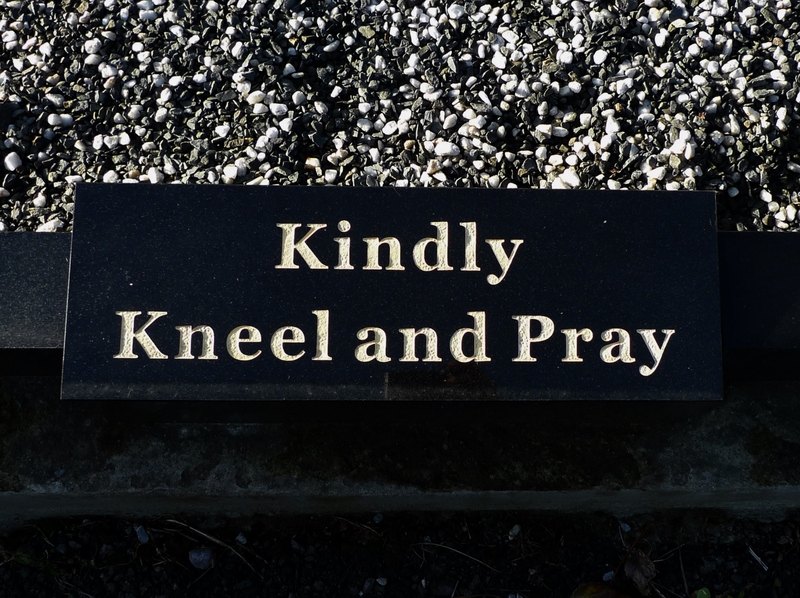 As we explored the ruin of Lislaughtin, there were many people and many notes to visitors, such as a bar that was carved with the words, “kindly kneel and pray” – a polite suggestion that reminded you of where you were and that the space should be full of reflection, remembrance and respect. It was hard not to listen to the ancient women speaking in soft Gaelic to their loved ones that were interred there, or to try to figure out who they were. Instead, we felt like intruders and snuck out quietly. I think we were wrong to feel that way. I believe that our culture has a different idea of what death is and that being raised here, we felt uncomfortable in the presence of those who simply see death as a different way to honor a life that touched theirs. It is not as if we were disrespecting the grounds or the people in them with our presence – we were stunned by the history and the beauty of the place – yet we still felt like our presence there was unsanctioned somehow, and I think that is due to the fact that our culture views death as the end of someone. We see their grave as a sad obligatory place to spend their birthday or a holiday. Many in our culture do not view it as a place to tell stories or catch up with a spirit, or a place of enlightenment or beauty. For us, it is a sad reminder of who WE lost and an uncomfortable moment of where WE will eventually be, which is not something our self-centric society is OK with. We do not see it as a peaceful and holy spot for THEM to rest, or a thing to reflect on except in how their loss pertains to us. The short attention span of Americans and lack of a long history seeps into our lives in the strangest of ways. I believe this to be one of them. We are so into ourselves and our lives that once one is over, we still make the ghost about those of us that remain. We either hang on to them with a clutched fist, parading our pain for years to come until it integrates with who we fundamentally are or we turn off and become numb to the process of death or grief. We demand information, sympathy and respect for what we have gone through – but often, we do not give the same to those we have lost, unless it is a sad anniversary, important date or birthday. Either we become brittle and judge everyone for not understanding our pain or we cling to the memories of that person so much that we forget we have a responsibility to live ourselves, if only so that we have stories to tell them when and if we meet again or spend a day at a graveyard. Some of us put our dead on an impossible pedestal, suddenly turning them into the saints we aspire to be until we forget who they really were or what conflicts we may have had with their personalities or traits. We use them as a marker in our own lives, to judge who we were before and after they were gone, and we wear our badges of how much sadness we feel without them – using this as an excuse to judge or to pull away from others who can’t possibly understand our loss or our feelings. We hang their pictures up on social media as proof of how we still remember, never once thinking of how that may affect other people, when they come across the feed. We vaguebook about feelings, about deaths, and about who, how or where we are in our emotional state and we have no consideration for whether we should do these things and no concept of how it may affect others or our relationships with them. It’s now, now, now – all the time and gods forbid if anyone judges or questions that instant gratification. The lesson I learned while traveling, is that the person in the ground, ocean, urn, or cannon is someone that we can carry with us every day without the misery, loss or badge of fucked up baggage. That person is still a person, separate from how they affected us – and when you take the ego and the demand out of the equation, you are left with someone you liked, loved or perhaps didn’t even care for – but who touched you somehow, and perhaps it could be better for them to hear it themselves. It may also be better for us to tell them, rather than the “friends” we have on an internet site. Don’t get me wrong, EVERYONE grieves differently, just as everyone loves and lives differently – and far be it from me to judge anyone on how they do it. I’m just thinking out loud here about the differences that I have seen while traveling through parts of the world that can’t rely on the internet and how I saw them deal with their losses without that tool. There’s a ritual side to actually stepping away from the screens and heading out to a place for the memories and the visits that just isn’t possible to convey on the internet – and I liked being reminded of that and seeing it firsthand. I guess that is what this post is about, more than anything else. In this day and age, we find out on Facebook when a friend or acquaintance has passed, or when our loved ones are hurting, remembering or grieving. The separation that brings is getting harder and harder to erase as the instant information culture booms and the paranoia and anxiety that brings is palpable. Sending a (hug) is not the same as holding that person in your arms no matter what, and feeling that lack of human connection has been harder since traveling to a place that doesn’t have that constant demand for instant information or gratification. The mirror was hard to look in to, as I have been guilty of all these things too – and what I learned there is that FOR ME, it is not OK. It is a lesson that I hope stays with me for a long, long time. This entry was posted in Death, Ireland, Politics and tagged cemetery, Ireland, Lislaughtin, sociology, traveling.